We have been learning about ways to strengthening operant behavior through reinforcement. Like we already learned behaviors can be strengthened through reinforcement. But what we did not touch on is that a behavior can be wakened through extinction. 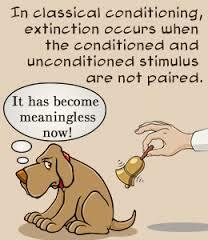 Extinction is the non-reinforcement of a former reinforced response; the results of this process is a decrease in the strength of that responses strength. For example, a child learned that every time he whines he will receive candy, he will continue to whine every time he wants candy but, if you switch it up and withhold the candy the frequency of the whining will decline. This is an example of a gradual weakening of a conditioned response that resulted in the behavior decreasing or disappearing. When you stop rewarding the behavior will eventually stop. This is something that is important for everyone to know, it is a useful tool that we will all come across as adults whether we are dealing with a child or an animal. Gabby, I wrote about operant conditioning as well. There are a lot of great example mentioned in the book. For example, someone going to work everyday in return they receive a paycheck weekly. In my experience, I know this to be very true. I have a dog, and we have unknowingly conditioned her to know that if we walk into the laundry room (where her treats are located) she can expect a treat if she sits looks cute in front of the door. Because we realized she can easily get us to reward her for doing nothing, we stopped doing that. Now she does not expect anything when we go in the laundry room. For me, this is proof enough that extinction is well alive and actually works.